Edify comes alongside entrepreneurs who offer quality Christ-centered education to children in their underserved communities. We provide training to equip school leaders to develop sustainable Christ-centered schools, loan capital to improve and expand school facilities, and education technology to enhance learning outcomes and employability. Since 2009, Edify has partnered with 3,649 schools, loaned out $27 million ($17.4 million is recycled), trained 9,342 teachers and school leaders and have impacted a total of 1,038,451 students! We praise God for what He has done. LEVERAGE: $1 of net new loan capital = $5.35 in loans to schools. GROWTH: 100% increase in loan capital deployed to schools over the past 3 years. SUSTAINABILITY: If Edify stopped deploying new loan capital to the field, our microfinance partners would continue to make loans from the recycling of existing capital. Each year, Edify hosts couples, families, and individuals to see our work around the world, giving them an opportunity to experience the culture first-hand, meet our international staff, and interact with schools and proprietors we serve. Please download the full Annual Report for more content. Inside, you will meet the passionate men and women who lead and advise Edify, and read inspiring stories of how God is working through Edify! Edify’s work is scalable and sustainable. If you want to make a lasting impact on underserved communities, please donate, or contact us if you have questions. Growing up in the 70s, all of the neighborhood kids would gather to play football. Occasionally, when our team was facing what seemed to be an insurmountable deficit, the quarterback would say, “Everybody go long!” We all would line up and wait for the snap, then run as fast as we could. The quarterback would throw the football down the field, praying for a miraculous catch. There was little strategy involved, just a desperate throw of the football. When we say Edify is going deeper, we are not saying “Everybody go long!” In fact, just the opposite. We believe in a Spirit-led strategy that is informed by data collected in each country. This ensures that the ways we walk alongside and support our partner schools accomplish what we set out to achieve. For the past five years, we have been working with Jonathan Mitchell, PhD, president of Concentric Development, to create a system of data collection in addition to a database to assess the impact of our programs. We have also been working with the University of San Diego to develop a leadership training program. Professor Paula Cordeiro (the University’s former dean of the School of Leadership and Education Sciences) has been consulting with Edify to improve educational outcomes in the countries we serve. As a result, many schools have made great strides in improving their conditions for learning and teaching quality through participating in Edify trainings. The strategies we have developed have allowed us to go deeper in the areas of evaluation, training, and overall service to our partners. 2018 was a wonderful year of growth for Edify. We experienced 51% growth in the number of students impacted and 59% growth in partner schools. Over the past two years, we have seen a 30% increase in revenue, averaging 15% annually. We also hit a significant milestone this year: impacting one million students since our inception nine years ago! I have the privilege of visiting the field often, and I am always amazed at how God is working among our partner schools and the impact these schools are having on the students. I hope you are encouraged as you read the stories in this report. You will read about Mark, once a student at an Edify partner school, now flourishing as a leader in his community. You will also read about the new mentorship program for schools in the Dominican Republic and, lastly, how education technology is making a significant impact in Ghana. We are committed to continue improving and expanding sustainable Christ-centered education globally. We are very excited about going deeper into the nations we serve! Thank you for partnering with Edify to make an impact in over one million students’ lives in ten countries with a quality Christ-centered education. We take seriously our responsibility to be good stewards of what the Lord has entrusted to us and the work we do. Therefore, Edify is committed to asking the right questions in determining what is working and what is not to better serve those we are walking alongside. Annual surveys given to partner schools collect data on eight key indicators spanning from Business, Accounting and Finance to exposure to the Word of God in order to quantitatively track sustainability and growth. School visits by our local staff enhance monitoring and evaluation and help integrate newly acquired skills after trainings. It is vital for our staff to build strong relationships with our partner schools to ensure continued growth and flourishing. Most Significant Change stories are collected from students, teachers and proprietors to understand the transformation happening qualitatively as a result of our programs. 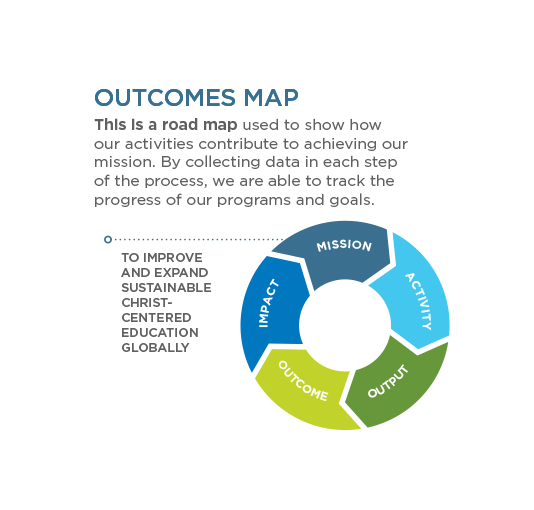 The School Database is a tool used to organize data and ultimately make informed decisions based on the successes and challenges within our programs and in our overall approach. Total revenue for the year from donations and other income was $6,484,319. This represents a 3% increase over total revenue of $6,303,536 in fiscal year 2017. Taking into account the significant 26% revenue increase in 2017, total revenue the past two years surged a combined 30%. Program expenses of $5,027,456 exceeded the prior year of $4,291,486 by 17%. Edify deployed the $677,536 surplus from last year to fund program services in 2018 as planned. Programs delivered during the year impacted 2,375 low-fee independent Christian schools in 10 countries. Training was provided to 5,140 school leaders and 4,996 teachers. Lending partners funded a record 584 loans to 553 different schools at an average loan size of $8,248, compared to 529 loans to 490 schools at an average loan size of $8,289 in fiscal year 2017. Edify diligently seeks to distribute the highest percentage possible of donations to fund training, loans to schools and education technology programs to improve Christian education in the 10 countries where we work. Program expenses in fiscal year 2018 were 78% of total expenses or $5,027,456. Of this amount, $4,127,476 went for programs that included Christian character development for students, school proprietors and teachers, along with business training for proprietors, educational technology training for teachers, and mobile learning devices in primary school classrooms, curricula and life skills training for children. Net new capital of $899,880 in the form of loans was disbursed to lending partners overseas to make loans to school proprietors. Loan volume to schools was a record $4,816,798 or 535% of the new capital Edify provided to lending partners in 2018. This 5.35 to 1 ratio of new school loans disbursed to net new loan capital demonstrates the leverage, sustainability, and increasing multiplier effect of recycled principal repayments. Cumulative loan capital deployed by Edify internationally for school loans was $9,587,317 from fiscal year 2010 to 2018. Cumulative loans to schools by lending partners and directly from Edify was $27,028,445 or 282% of the loan capital from Edify because of recycled principal repayments. Some lending partners borrow from the capital markets to further leverage the loan capital from Edify. Loans to lending partners are in local currency and often have a grace period on the front-end where no payments are due. As a result of the favorable non-market loan terms, for GAAP purposes (generally accepted accounting principles) our independent CPA firm has classified these loans to lending partners as grants. These loans with non-market terms in depreciating currencies do not appear on our balance sheet. We receive a full audit each year by our independent CPA firm with the findings reported directly to the board appointed Audit Committee. Board member Kurt Knapton, MBA, currently serves as the Audit Committee Chairman. Former board member and Audit Committee Chairman, Dale Dawson, CPA, a former audit partner at KPMG, is a non-board member of the Audit Committee. Total revenue of $6,484,319 exceeded total expenditures of $6,428,211 for a surplus of $56,108 or 1% of total revenue. The combined operating surplus over the last two years was a healthy $733,544. Restricted cash on the balance sheet to fund specific programs increased from $1,156,975 the prior year to $1,254,925 at fiscal year-end. These restricted funds are planned for disbursement in 2019 to fund their respective program designations for teaching children a Christ-centered worldview, proprietor and teacher training, school loans and education technology.